This week we were saddened to hear the loss of John Mulvaney, the ‘Father of Australian Archaeology’, who died last Wednesday aged ninety. Professor Derek John ‘John’ Mulvaney was one of the three ‘giants’ of Australian archaeology, a long-time resident of Canberra and hugely influential academic at the Australian National University (ANU). Born in country Victoria in 1925, John finished school before joining the Royal Australian Air Force (RAAF) during WWII. His time in England during the war helped spark an interest in prehistory and he spent his spare time visiting various historic sites. ‘One glorious evening I cycled at random up a narrow Cotswold road and suddenly came upon the prehistoric Rollright Stones. They were unexpected, unkempt, partly concealed by vegetation and redolent of a past about which I was ignorant. This was my first contact with the deep prehistoric past ... This romantic ambience ... influenced my deeply,’ (p. 34). After the war, John studied History at Melbourne University and later Prehistoric Archaeology from Cambridge, where he met his first wife, Jean. He spent some time teaching and was convinced by his friend Jack Golson (another giant of Australian archaeology) to relocate to the ANU in 1965. The move to Canberra with Jean and their five children (with number six on the way) during a vital period in the growth of the ANU and the city was huge turning point for John’s career. He recalls that the ANU was very welcoming, arranging for family accommodation and helping settle their children into the new home in Yarralumla. ‘The children made full use of the spacious backyard... more than 40 years later, the central area of our yard remains open. It evolved into a cricket pitch, where all birthdays and family events are celebrated. The rule is ‘out’ when the ball is hit over the fence or dislodges fruit from a tree.’ (p. 124). At ANU, John founded the Department of Prehistory (now called the School of Archaeology and Anthropology) where he later became Professor. He quickly became involved with the Canberra Archaeological Society, which was founded in 1963 by Jack Golson and several others. He loved teaching undergrads and was frequently praised as an inspiring teacher who encouraged many future archaeologists and heritage professionals. ‘I felt like an explorer in this ancient landscape...I felt a strange sensation, for surely this was a ceremonial site of profound significance. It was not a place in which to be alone, or even to be present in this undoubted sacred space,’ (p. 109). The Lake Mungo discovery of 26,000 year old human remains was particularly groundbreaking and is still considered the earliest example of human cremation. John demonstrated scientifically that Aboriginal people had been living in this land for a very, very long time (something that was not easily accepted), and by doing so, confirmed the oral history of the Aboriginal people. John was also involved in the inauguration of the Burra Charter, a highly important and innovative document that governs heritage professional practice in Australia. He was the chief Australian delegate to the first UNESCO meeting in Paris that established the criteria for World Heritage listing. He insisted that the Willandra Lakes Region (where Lake Mungo is) and Kakadu National Park were placed on World Heritage list. He was an active campaigner for the protection of Aboriginal sites and heritage, and helped reconcile archaeologists, biological anthropologists and the Indigenous community, treating the community as people and not just subjects of study. ‘In those protectionist times [1960s], a researcher was neither required nor expected to consult the Aboriginal people amongst whom work was proposed. The prerequisite to enter the Arnhem Land Reserve was to have the permission of the relevant mission authority ... Only then could application be made to the NT administration... Another requirement was to produce a clear chest X-ray to prevent the transmission of tuberculosis,’ (p. 127). Among other positions on a huge variety of councils, John sat on the inquiry that led to the creation of the National Museum of Australia; championing the role that it could have promoting understanding and appreciation of Aboriginal culture. He recommended the creation of a separate Gallery of Aboriginal Australia, now known as the First Australians Gallery, which many of our readers may have visited. His wife Jean died in 2004 after fifty years of marriage. He later married Elizabeth and they remained living in Yarralumla for several years until John’s eventual decline. Libraries ACT holds a number of his publications including the iconic Prehistory of Australia, and his biography Digging up a past. 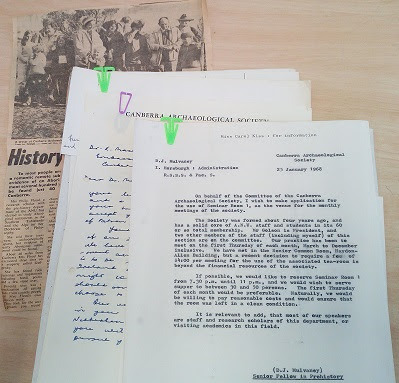 The ACT Heritage Library also holds the papers of the HMSS 0142 Canberra Archaeology Society, including correspondence and memos written by John himself. It’s worth digging in to these sources to find out more about the man who shaped so much about how we think about our past. Australian National University. 2011. Interview with Emeritus Professor John Mulvaney – historian and prehistorian. 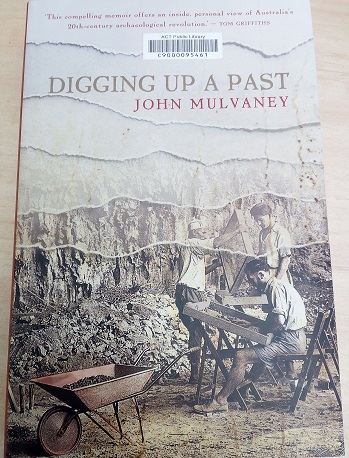 [ONLINE] Available at: http://www.anu.edu.au/emeritus/ohp/interviews/john_mulvaney.html. Australian National University. 2016. Vale Emeritus Professor John Mulvaney. [ONLINE] Available at: http://www.anu.edu.au/news/all-news/vale-emeritus-professor-john-mulvaney. National Museum of Australia. 2016. A tribute to John Mulvaney 1925–2016. [ONLINE] Available at: http://www.nma.gov.au/media/media_releases_by_year/current_year_-_2016/john-mulvaney-tribute.